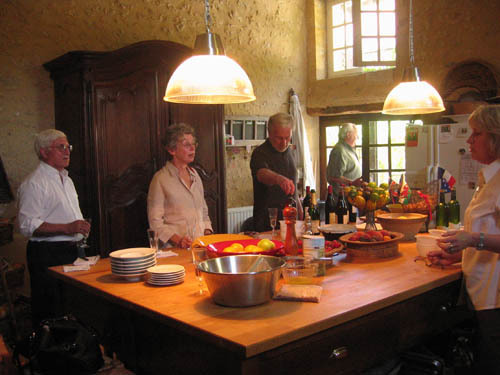 We had lunch with Wendely Harvey and Robert Cave-Rogers, owners of La Combe en Perigord, a cooking school in the Périgord. 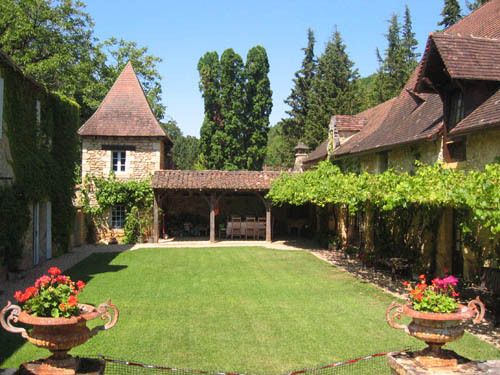 La Combe is a maison de maître (gentleman’s house) close to the town of Les Eyzies and the Vézère River. In the well-appointed and large kitchen where the cooking classes are taught, we had dates stuffed with foie gras (the combination was wonderful) and champagne, a Brut from Victor Legeune. Robert said that it was their house champagne. The school invites guest chefs to give cooking lessons for one week. We were given a tour of the guest rooms and I wanted to stay. Michele would love to give cooking lessons here– if anyone is interested let me know! Lunch was served in the garden not far from the swimming pool. It was wonderful sitting outside in the warm afternoon sun eating an excellent meal and drinking wine. Robert served a Bergerac white and rosé, and two red wines. The Bourgogne 2005 Pinot Noir from Louis Chavy went very well with the salmon. The other red was new to me, Fronton (Cotes du Fontonais) from Au Domaine Le Roc 2005 “Le Classique”. It is field blend, 60% Negrette, 35% Syrah and 5% Cabernet Sauvignon with undertones of spice and red fruit. At least three grape varieties must be used in the wine. This one was aged 12 months in stainless steel with very light filtration. Negrette was brought to the area between Albi and Toulouse from Cyprus by the Order of Saint John of Jerusalem in the 12th century during the Crusades. This grape is grown in the area around the villages of Fronton and Villauduc. It is also grown in California where it was called Pinot St George. In 1997 the law was changed and now the French Negrette is used instead. This looks like a wonderful experience in a perfect setting! Goodness me. The dates stuffed with foie gras sound rich!